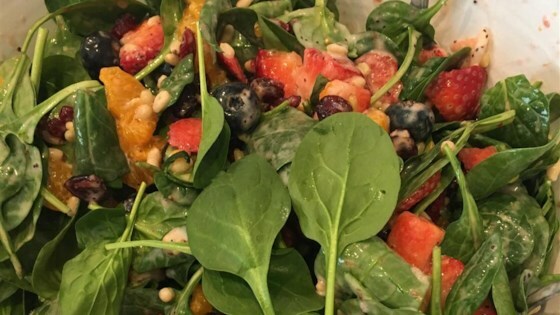 "My coworker Lori makes this salad whenever she is in charge of Friday breakfast and we all absolutely love it...and it's so easy. Absolutely no cooking required, so it's great during the warm summer months." Place spinach in a large bowl. Arrange bananas, strawberries, mandarin oranges, cranberries, and pine nuts on top. Toss with poppy seed dressing before serving. This was wonderful served with zucchini fritatta and mimosas. I will be making this again and again. This is so good I could eat it for dessert!!!! Wonderful! I took this to a brunch buffet and hoped to offer something unique! Excellent reviews and many requests for the recipe!!! Bravo!